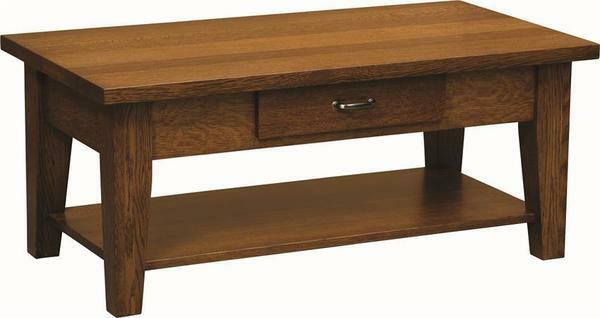 A good coffee table uses strong lines and quality construction to bring the living room into focus - and the Heritage Shaker is a very good coffee table. Built by hand in a small Amish woodshop in the northern United States, this coffee table is crafted with a deep pride and steeped in the intention that it will stay beautiful through decade after decade of movie nights, coffee dates, and Sunday newspapers. This piece provides the living room with a seamless focal point, bringing the convenience of its wide surfaces and large drawer without compromising on its traditional style. Use the menus above to choose the perfect wood and stain for your made-to-order Heritage Shaker. If you run into any questions at all, or if you would like to see free samples of our woods and stains, please reach out to us by phone or by email. We love the timeless simplicity of this piece, and we would love to talk with you about what it brings to the living room. And while this coffee table shines on its own, we are also proud to offer a full range of Shaker tables that perfectly match this one. Simply scroll down to the "Heritage Living Room" tab below to learn more. Heavy Distressing - Our ultimate antique finish. Rub-through of the rich patina are masterfully punctuated with another level of extensive nicks, pin holes, eased edges, simulated cracks and other distressing techniques to bespeak several centuries of robust wear and loving care.